1. All NSCA members are eligible, including International members. There is no minimum event participation required for the Points Race, but to be eligible to win the Championship Tour you must participate in the Main Event, FITASC Event or 5-Stand Event at either the National Championships or U.S. Open. 2. Champions will be crowned in 14 categories – Open, Lady, Sub Junior, Junior, Veteran, Super Veteran, Senior Super Veteran, Master, AA, A, B, C, D, E.
3. Points will be earned from three events each at a total of seven tournaments: the Main Event, 5-Stand Event and FITASC Event at the five Regional Championships and U.S. Open; the Main Event, Krieghoff Kup, and FITASC Event at the National Championship. 4. A shooter’s eligibility for concurrent awards is based on the shooter’s current NSCA classification. 5. A shooter’s eligibility for class awards is based on the shooter’s NSCA class at the beginning of the target year. 6. 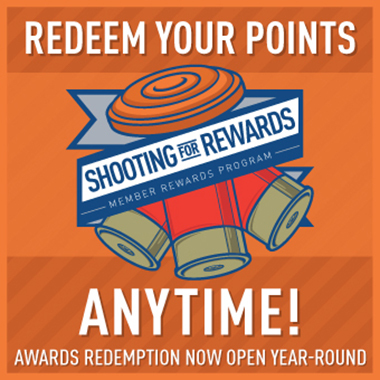 The top 10 shooters in each of the 14 categories within the Main, FITASC, and 5-Stand/K-Kup* Event at each of the Championship Tour events will be awarded points. This is the method used to distribute points in all 14 categories. Notice that tied scores are given the same number of points but the next lower number is skipped so that only 10 points are distributed. 8. Tour Champions will be crowned in all 14 categories by counting their top 5 scores in the Main, 5-Stand/K-Kup, and FITASC Events. The top 5 scores in all three categories are added together for a Top 5 Grand Total. Thereby a max of 150 points could be awarded (50 — Main Event points, 50 – 5-Stand/K-Kup points, 50 – FITASC points). 9. In the case of ties for crowning Tour Champions, head-to-head competition in all three disciplines will be used beginning with the Nationals. If one or more of the tied shooters did not attend the Nationals or participate in all three events, we would then use the next largest attended shoot, based off the Main Event participation, in which all tied shooters participated in all three events. Example: Shooter A and Shooter B are tied with 129 points when you calculate their top 5 grand total. To break the tie, you would look at their total National Championship points. Shooter A would win the tie based on the stats below. See the Championship Tour Points Race.